A combination of team work, community funding and a Waimate archeologist skilled in the field of skeletons and anatomy, has meant the town has a moa exhibition that has impressed some of New Zealand's moa research elite. The Waimate Historical Museum exhibition which runs until November, received a visit from a group of top moa experts, including from Te Papa, who were on their way to a key moa site at St Bathans. Intending to stay only five minutes, instead they stayed 90. The exhibition is special to Waimate because of the Kapua moa excavations of 1895. Kapua, at one end of the Waimate gorge, was the resting place of 800 moa skeletons. 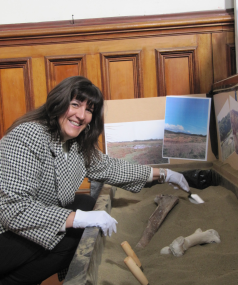 English archaeologist, Joy Langston, who now lives in Waimate, was charged with using her expertise to help create the exhibition. She said the Kapua moa site was initially discovered by a farmer, a Mr MacDonald, who was digging a sink hole for water. He told Captain Frederick W Hutton, the curator of Christchurch Museum(as it was called), who put the museum taxidermist in charge of the dig. "They literally just dug a hole to bring as many bones out as they could. Excavations then weren't scientifically done." Beside the dig were heaps of bones rather than sets of complete birds, but the bones amounted to 800 birds. There is a kill and butchery site at the Waitaki mouth, but the Kapua birds had all died naturally, over several generations. The Kapua swamp was a feeding area dotted with spring holes connected to a ground water supply. They would die, and after the birds decomposed, the bones would fall down the spring hole. The birds at Kapua have been dated from 1014-714BC. "It wasn't a mass `let's walk on to the swamp and kill ourselves', it happened over a long long time," Dr Langston said. The exhibition team, with the help of Dr Langston and her scientific research expertise and contacts, are presenting some of the latest research. Wikipedia has the number of moa species at 11, but researchers now know that there were nine, adapted to different environments such as the swamp, the uplands, the forest or the coast and climates as differing as the West Coast from the East. Dr Langston said early researchers believed the skeletons of the male and female, with the latter being somewhat larger than her mate, belonged to different species. But with access to DNA testing, the science world has been able to accurately pinpoint the different species. The different habitats of the moa meant they evolved differently, with the upland species being smaller, with feathers down to their toes for instance, or the stout legged moa suited to forest living. South America (rhea), Africa (ostrich), Australia (emu and cassowary) and Madagascar (elephant bird – extinct) all have or had large flightless birds called ratites, of which the moa is one. The kiwi is also a ratite. Interestingly the moa is genetically more closely related to the South American tinamou than it is to the kiwi. Although moa are unique to New Zealand, indications are that the ancestor ratite bird was living when ancient continent Gondwana was one land mass, and well-distributed throughout, Dr Langston said. All this suggests the ancestor moa was on New Zealand when it drifted away 86 million years ago, but with New Zealand having been submerged in water and going through ice ages, the fossil evidence dates back about 20 million years. The oldest moa bones date back only two million years, but the work at St Bathans revealed the older fossil evidence. When the Southern Alps formed five to eight million years ago, the different habitats created meant the moa evolved into the nine different species. Dr Langston said the ability to get ancient DNA samples has revolutionised science for humans and "all sorts of species". Moa have no evidence of ever having had wings – unlike the kiwi which has tiny wing bones. Researchers have been able to work out that centuries old feathers have not faded and moa were probably shades of brown like the kiwi. Some had a a speckled appearance and others had streaking. With barbless feathers they were probably quite shaggy, rather than smoothly preened. Their only predator before Maori arrived was the haast eagle, which could have a wing span of more than three metres, and which crushed bone with its powerful talons, she said. However, after Maori arrived (in 1280 according to a 2010 carbon dating of campfire charcoal), it took only a few generations of human habitation, until 1400, for moa to become extinct. Dr Langston said there were thought to be around 160,000 moa in New Zealand at the time Maori arrived (a figure based on scientific modelling). Being a K species, long-lived and bearing a small number of young at a later age, they were also vulnerable to extinction. Humans and elephants are other K species. The giant birds, naive about humans, were a good package of easy meat to a hunter. Big adults were hunted out first, cutting out the breeders. Younger ones followed, before they could breed. Moa eggs were also being eaten. Interestingly, museums all over the world still have moa skeletons posed with their necks stretching straight up. Now knowing more about anatomy and bones, researchers know their necks curved horizontally, in line with their backs. The exhibition features a bone from the Kapua dig which still has its hand-written metal tag attached. Other items come from museums further afield. The Canterbury Museum's contribution was halted, days before it was to be transported, by the February earthquake. Fortunately, Otago Museum was able to step in.